Six hard-working West Virginians were honored Oct. 22 for exemplary vocational rehabilitation through the West Virginia Division of Rehabilitation Services. The annual Ability Works awards honor one outstanding candidate from each of the agency’s six districts, coinciding with National Disability Employment Awareness Month. Gary Hefner of Marlinton spends his days taking care of other people, now that he's taken care of some health issues that troubled him for much of his young life. Hefner, a licensed practical nurse at Greenbrier Valley Medical Center, is the 2009 Ability Works state award winner for West Virginia. He represents the Beckley District of the West Virginia Division of Rehabilitation Services. Several childhood surgeries for a club foot left Hefner with scar tissue that led to recurring inflammation and pain in the bones of his right foot. To treat the infection, the doctor gave Hefner a choice to place screws in his leg or to amputate, and he chose amputation. "I actually don't look at it as a disability," Hefner said, "because I feel a lot better than I did before." He uses a prosthetic leg below his right knee. When he sought help from DRS in 2004, Hefner was trying to manage both diabetes and hypertension without medication. A stroke only four years earlier had prompted him to take his own health very seriously, and he lost 77 pounds by maintaining a healthy diet and rigorous exercise program. DRS Rehabilitation Counselor Nancy Harris says this perseverance was an indication of his positive attitude and self-discipline. Harris could tell that Hefner had given his future a great deal of thought. He was certain that he wanted to pursue a career in nursing. "He was anxious to return to work to be able to adequately provide for his family, to restore his sense of purpose and self-worth, and to use his talents and abilities to help others," Harris said. Hefner, a father of three, scored exceptionally well on the entrance exam for nursing school, then completed an impressive interview and all the necessary medical exams. DRS assisted him with the resources for training and travel, because the closest nursing program meant a daily drive of more than 90 miles across mountainous roads in extreme weather. "Anytime I had a problem with anything, I could call Nancy," Hefner said. Despite the constant and overwhelming academic demands of the nursing program, Harris said, Hefner faced every obstacle with incredible calm and surmounted every hurdle – from sick children to frequent mechanical problems with his vehicle. With all these everyday difficulties, he also faced the death of his grandmother and his father while in nursing school. 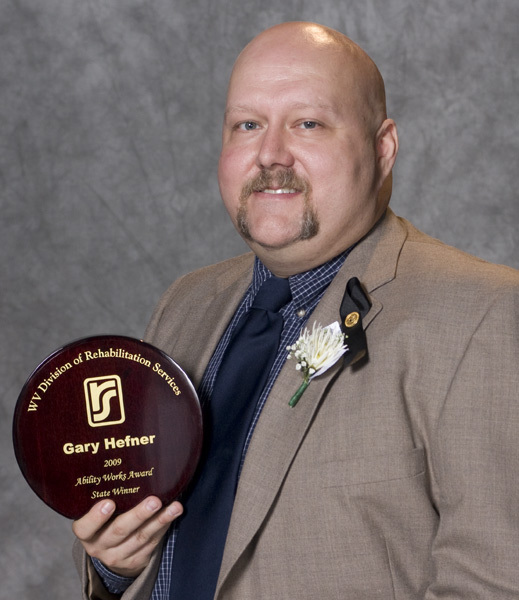 "There was never any question about Gary's intellectual capabilities, commitment to his chosen vocation, or any question about his personal qualities of caring and compassion so necessary in the nursing field," Harris said. In April 2008, Hefner was hired at Greenbrier Valley Medical Center as a licensed practical nurse. Hefner says he is proud to give back to the profession that helped him so much as a kid. "I had many surgeries where there were nurses that took great care of me," he said. Hefner's helpful attitude is what makes him a good employee, along with his willingness to do whatever he can to give his patients the best experience possible, according to Michelle Carpenter, Greenbrier Valley's Nursing Director of Medical Surgical Pediatrics. "It's never good to be in the hospital," she said, "but Gary goes above and beyond with his patients." Carpenter believes Hefner's positive, upbeat attitude affects co-workers as well as patients. She praises his optimism and says he never fails to remind the staff that they are doing a good job. To Gary Hefner, that's not such a big deal. "I love the people I work with, and what I'm doing," he said. Dan Clarkson has defied the odds, surviving a terrible motorcycle accident while nurturing an optimism that drives his life and his work. 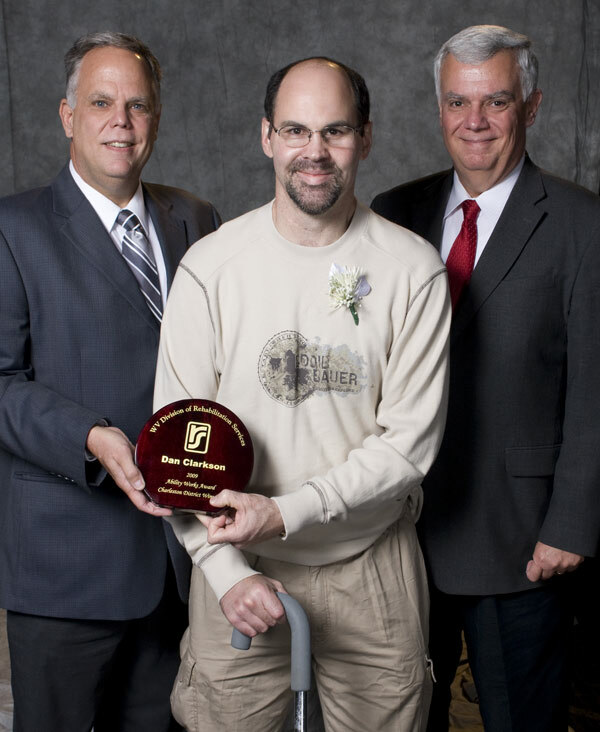 Clarkson, a St. Albans resident, is the 2009 Ability Works award winner for the Charleston District of the West Virginia Division of Rehabilitation Services. DRS Senior Rehabilitation Counselor Cynthia Lokey describes his road to recovery as "rough." Yet somehow, struggling through his own physical rehabilitation and the death of his wife, Clarkson never lost sight of his goal to return to a normal way of life. "His best characteristic is that he just doesn't give up," Lokey said. Clarkson sought help from DRS to provide him with occupational and physical therapies he needed to recover from a spinal cord injury and return to his law enforcement career. Tasks that were once mundane, such as answering phones and pulling files, had to be relearned to perform his job as a protective service worker in the Kanawha County Sheriff's office. DRS provided Clarkson with physical therapy, occupational therapy, driver evaluation and vehicle modifications, assistive devices and home modifications. He used assistive devices and hand controls in his car until he was able to care for himself and regain his mobility. Through it all, his wife Susan remained his inspiration. "She always knew I would walk again," Clarkson said, "and got me to walk again before she passed away." Clarkson's resilience is reflected in his character as well as his work ethic. His employer, Kanawha County Sherriff Mike Rutherford, says the department is lucky to have him. "I could not ask for a better employee," Rutherford said. Clarkson also has an effortless way of getting along with everyone in the office. "Everybody that works with Dan absolutely loves him," Rutherford said. "He has a great personality and relates with many people." Although he has been through a lot physically and emotionally, his success with rehabilitation and his career come from faith, positivity and from being naturally athletic. "I am ‘a glass is half-full' type person," Clarkson said. Since the accident, he doesn't let anything get in the way of the hobbies he has always enjoyed. His past experiences in the Marine Corps and boxing have encouraged him to remain an active scuba diver, sky diver and white-water rafter – sometimes even as a guide. The day before his accident, he participated in the local March of Dimes charity fundraiser walk. He has remained a loyal participant since, showing up in his wheelchair for the past two years to help raise money. Clarkson proves that with the right way of thinking, almost anything can be accomplished. "If you ever have an injury," he said, "faith in God and the attitude to never quit is the best advice." Because of her warm, cheerful personality and her enthusiasm for her job, Kalin Hanlan is the perfect hostess. The qualities that have made her successful in a busy Applebee's restaurant caused her to be honored as the Ability Works award winner for the Clarksburg District of the West Virginia Division of Rehabilitation Services. Hanlan, of Bridgeport, was referred to DRS in high school and wanted assistance developing her interests into a possible career. Because of an extremely premature birth, Kalin was diagnosed with a learning disability and retinal degeneration, causing vision impairments and mobility problems which made it difficult to obtain employment without the support of counselors and job coaches. "I was still in high school," Hanlan said, "and I wanted to take some time to think about what I wanted to do." DRS Rehabilitation Counselor Patricia Shingleton says Hanlan kept in touch daily during her job search. "She's worked really hard," Shingleton said. "She was very motivated when she initially came in to find work." DRS' initial assessments suggested Hanlan would benefit from working with a job coach, so she was referred to a local rehabilitation provider. Job Squad, Inc. helped her fill out applications and taught her valuable interviewing skills that helped prepare her for a successful job search. "Kalin just stayed right on top of any job search assistance we were providing her, and was very motivated the entire time to locate employment," Shingleton said. Hanlan's outgoing personality indicated to Shingleton that she would work well with the public. Her job search included opportunities as a receptionist as well as work in restaurants, childcare and other retail businesses. She found a job as a hostess at Applebee's in Clarksburg, and has been working there part time for one and a half years. She enjoys her job, and not surprisingly she enjoys the social aspect of being a hostess. "I like getting a paycheck, just being around people and getting to know the people I work with," Hanlan said. Shingleton believes the job is a perfect fit for Hanlan. "I think it's a lot of a social outlet for her," she said. "Kalin was able to make friends and she's just doing really well." Hanlan also is gaining the work experience she will need if she considers moving up with Applebee's or finding other employment. She has drive, determination and a smiling face to go along with it. "I do see Kalin, with her abilities and as good as she's doing, that she could move up to management in the future," Shingleton said. "And I do hope that does happen for her." Shingleton also believes that Hanlan's devotion and eagerness to the entire vocational rehabilitation process was worthy of recognition. "I truly feel, just with all the hard work that she's put into this, she deserved to be nominated." Carolyn Hancock's dynamic personality is as great an asset as her accounting skills at Wheeling Island Hotel, Casino and Racetrack, where she has been a revenue auditor since January 2008. 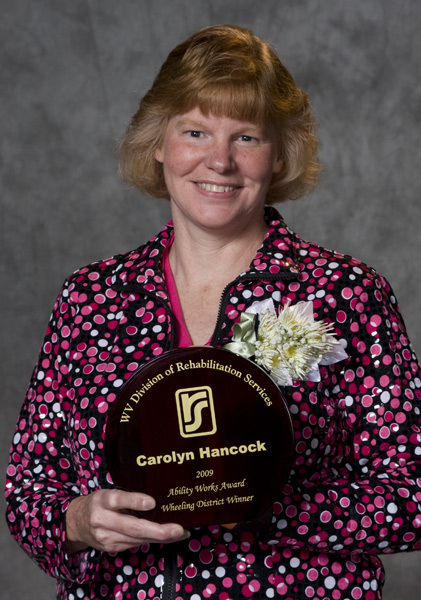 Hancock is the 2009 Ability Works award winner for the Wheeling District of the West Virginia Division of Rehabilitation Services. Originally from Yosemite National Park in California, Hancock moved to Wheeling when her husband was transferred to a new job. She thought finding a good job here would be simple, but soon realized she needed help reaching her employment goals. After assessing her needs, DRS provided college financial assistance, and an interpreter to help in her classes, job interviews, job testing, job orientation and training. "Carolyn understood she was working below her limits," said Michelle Hogan, DRS counselor for the deaf and hard of hearing. "She was more than willing to come to us and ask for assistance to help her work to her full potential." Hancock also worked with DRS Rehabilitation Counselor Faith Hicks, who suggested she go back to school to finish her bachelor's degree in accounting. She enrolled as a part-time student at Wheeling Jesuit University and found part-time employment as a finance assistant with Wheeling Housing Authority — all while raising two young boys. "Carolyn is a phenomenal woman," Hogan said. "She has maintained a hard working ethic ever since she has come to DRS." It took seven years to finish her degree, but then she was hired full time as a revenue auditor at Wheeling Island, where she also assists in communicating with other employees who are deaf or have profound hearing loss. Patrick Fox, vice president of finance at Wheeling Island, says Hancock's commitment to success is demonstrated in her hard work and her ability to be a great team player. "She's overcome a challenge to be an employee and a professional here at Wheeling Island," Fox said, "and we are just delighted to have her, because she communicates enthusiasm, passion and professionalism that is very important for our business." Hancock also has paved the way for Wheeling Island to hire others who are deaf. She works with the rest of the staff in learning to communicate and understand sign language. "Carolyn has done phenomenal things for the deaf community here in Wheeling," Hogan said. Her accounting and technical skills are impeccable, Fox said. "Using those skills to ensure that her work is done accurately is important to us as an organization because it involves the recognition of revenue, and Carolyn clearly understands that." "Some companies are afraid of hiring the deaf," Hancock said, "so I'm trying to show that I can do the work they want and I can do it well, and can do it better." Fox approves. He says bringing her on board at Wheeling Island was a great decision. "She is simply a role model because she has demonstrated that she can overcome obstacles in her life to be what she wants to be," Fox said. "We are blessed to have Carolyn on our staff." Justin Booth had a dream of becoming a pharmacist, and he has never let anything stand in the way of fulfilling that dream. 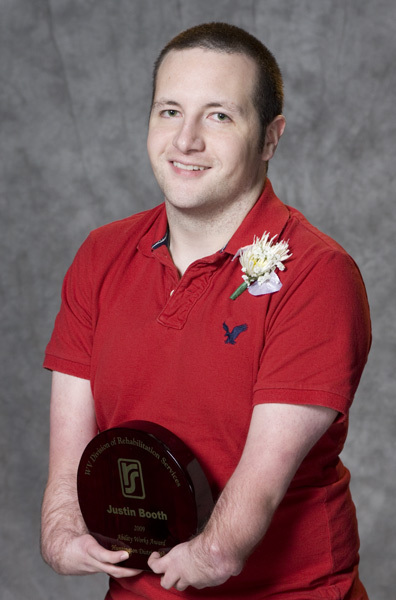 His persistence is one reason why the 28-year-old from Stollings has been named the 2009 Ability Works award winner for the Huntington District of the West Virginia Division of Rehabilitation Services. Booth is a retail pharmacist at the Kroger Pharmacy in Logan, an achievement he says may not have been possible without the resources he was provided at DRS. With assistance from a vocational rehabilitation counselor, he was able to transition easily from Southern West Virginia Community and Technical College to West Virginia University's School of Pharmacy. Southern is a fairly small community college, but still larger than the Christian high school from which Booth had graduated. "I didn't know how I was going to go to a new town and a big school, coming from a graduating class of 10," Booth said. "My first chemistry class in Morgantown had about 250 people in it." Booth was born with Holt-Oram Syndrome, a limb abnormality that affects bones in the wrist. He has short arms and no thumbs as a result, as well as a heart problem commonly associated with the syndrome. "My dexterity with my disability limits me a little bit," Booth said, "What may take five minutes for somebody else that doesn't have the disability to do may take me 15 minutes, but it comes out the same way and sometimes even better." He was receiving rehabilitation services in high school when Rehabilitation Counselor Debra Baisden-Fields took charge of his case. At the time, he had no classroom accommodations but was still maintaining between a 3.5 and 3.75 grade point average. Booth came to DRS seeking resources. He wanted to be able to call DRS to ask for help or recommendations about how to achieve his ultimate vocational goal. DRS provided vocational counseling and guidance, and financial assistance for the college and university training required for Booth to be a licensed pharmacist. Baisden-Fields said she tried to get Booth to use assistive technology during his schooling, but he preferred to do it his way. "He's learned his own techniques and styles," Baisden-Fields said. "I've never seen anything really that he cannot do as well as everybody else does." Booth is pleased with the help he received from DRS. "I couldn't have asked for anything better," he said. His employer, Kroger Supervising Pharmacist Tucker Shelton, believes that Booth has no limit to his abilities. Shelton adds that he would love to hire more people like him. "A lot of it is determination," Shelton said. "Justin is very dependable and has great morals and ethics." Along with his impeccable work ethic, Shelton says, Booth is one of the hardest working employees he has ever had. "He just doesn't stop," Shelton said. "He's like the Energizer rabbit." Booth loves his job and helping people. He considers pharmacists to be the most accessible medical professionals because on Saturdays and late nights, the pharmacist is about the only healthcare professional available. "That's a niche that I as a pharmacist can adapt to and feel good about," Booth said. He enjoys communicating, and counseling patients about their medications. Booth is working toward becoming a licensed pharmacist in several other states, too. "In the future, I really see Justin going great places with his career and his life," Baisden-Fields said. "I really see him moving up." Donna Southerly has transformed herself in just five years, socially and vocationally. Her eagerness to learn and rise above physical challenges has turned a shy, restrained person into a confident, outgoing woman. Southerly is the 2009 Ability Works award winner for the Martinsburg District of the West Virginia Division of Rehabilitation Services. The Hardy County resident is an administrative secretary and receptionist at Eastern West Virginia Community and Technical College in Moorefield. She also is a student, working toward a Regents Bachelor of Arts degree from West Virginia University. Southerly first came to DRS in 2004 after gastric bypass surgery for obesity. Before this surgery, she had spent 20 years unemployed and five years restricted to her house because of immobility issues. These problems took a toll on her confidence, as well as her understanding and knowledge of up-to-date technology, all of which she felt hindered her re-entry to the workforce. She had spent two months searching for jobs with no success, and was unsure of what she wanted, but DRS Rehabilitation Counselor Linda Porter helped her discover her vocational goals. DRS provided tuition assistance, counseling and training that helped Southerly earn her associate degree in science and encouraged her to pursue the Regents BA degree at West Virginia University, which she will complete in 2010. She may work later toward a master's degree in rehabilitation counseling or social work. "Donna is the best student I've had in my five years working at DRS," Porter said. "If you met her today, you would never believe that she used to be insecure." Porter isn't the only one who noticed Southerly's drive and determination. "Seeing her at Eastern a couple of years ago taking courses, to now actually being an employee at Eastern, is two totally different people, said Monica Snyder, former academic services program coordinator at Eastern and now Southerly's employer. "She has more confidence in herself, and she has goals that she knows she will reach." Southerly's need to achieve has made her a good student and a good employee. During her undergraduate career, making B's was just not good enough. Her final grade point average was 3.94. She is an equally remarkable employee. "Donna is a people person," Snyder said, "and wants to learn more in every aspect of the job, which helps everyone out." Southerly likes the change she sees in herself. "Today, I am outgoing, have self-confidence and know that there's nothing that I can't accomplish," she said. "She has so many options, and with her personality and outgoingness she will go places," Porter said. Because of her own experience, Southerly loves to help the students who come to Eastern. Several of them have come from DRS and she loves to see the difference Eastern and education has made in their lives. To Southerly, the most important part of her job is giving the same encouragement to others that she has received. "Someone was there for me," she said, "and I would like to be there for them."